Race Matters, Animal Matters challenges one of the grand narratives of African American studies: that African Americans rejected racist associations of blackness and animality through a disassociation from animality. Analyzing canonical texts written by Frederick Douglass, Charles Chesnutt, Ida B. 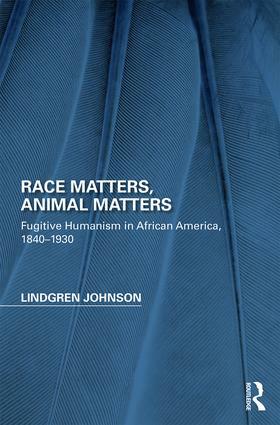 Wells, and James Weldon Johnson alongside slaughterhouse lithographs, hunting photography, and sheep “husbandry” manuals, Lindgren Johnson argues instead for a critical African American tradition that at pivotal moments reconsiders and recuperates discourses of animality weaponized against both African Americans and animals. Johnson articulates a theory of “fugitive humanism” in which these texts fl ee both white and human exceptionalism, even as they move within and seek out a (revised) humanist space. The focus, for example, is not on how African Americans shake off animal associations in demanding recognition of their humanity, but on how they hold fast to animality and animals in making such a move, revising “the human” itself as they go and undermining the binaries that helped to produce racial and animal injustices. Fugitive humanism reveals how an interspecies ethics develops in these African American responses to violent dehumanization. Illuminating those moments in which the African American canon exceeds human exceptionalism, Race Matters, Animal Matters ultimately shows how these black engagements with animals and animality are not subsequent to efforts for racial justice — a mere extension of the abolitionist or antilynching movements— but, to the contrary, are integral to those efforts. This black- authored temporality challenges widely accepted humanist approaches to the relationship between racial and animal justice as it anticipates and even critiques the valuable insights that animal studies and posthumanism have to offer in our current moment. Lindgren Johnson is Assistant Professor at the University of Virginia, USA.